Newspaper columnist and Montana rancher, Richard Geary, talks about rural culture then and now, and reads some of his essays. 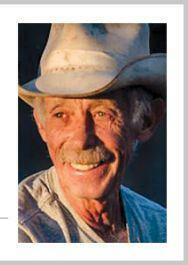 Richard Geary is the eldest of the fourth generation to operate the family ranch in Helmville, Montana. The property was homesteaded by his great grandfather in 1867, and the original farm in Ireland is still in the family. Richard acts as bookkeeper for the ranch, while his brother is responsible for the actual management. Geary began writing weekly columns for the Silver State Post in Deer Lodge, Montana, in 2013, when he was 66 years old. He's now published by the Philipsburg Mail , also. And the Missoulian runs a bi-weekly column of his. Peter Stark talks about and reads from ASTORIA: John Jacob Astor and Thomas Jefferson’s Lost Pacific Empire: A Story of Wealth, Ambition, and Survival. In 1810, John Jacob Astor sent out two advance parties to settle the wild, unclaimed western coast of North America. More than half of his men died violent deaths. The others survived starvation, madness, and greed to shape the destiny of a continent. During this program, Molly Caro May talks about her nomadic childhood and her search for a place to "be from." She also reads from her new memoir, The Map of Enough: One Woman's Search for Place. Molly Caro May grew up as part of a nomadic family, one proud of their international sensibilities, a tribe that never settled in one place for very long. Growing up moving from foreign country to foreign country, just like her father and grandfather, she became attached to her identity as a global woman from nowhere. But, on the verge of turning thirty years old, everything changed. Molly and her fiancé Chris suddenly move to 107 acres in Montana, land her family owns but rarely visits, with the idea of staying for only a year. Surrounded by tall grass, deep woods, and the presence of predators, the young couple starts the challenging and often messy process of building a traditional Mongolian yurt from scratch. They finally finish just on the cusp of winter, in a below-zero degree snowstorm. For Molly it is her first real home, yet a nomadic one, this one concession meant to be dissembled and moved at will. Nakoda Sky People is a compilation of poems from several of Allen’s smaller collections, and also contains a lexicon of Nakoda words and phrases as well as pages of Native recipes and herbal medicines. In an introductory essay to Nakoda Sky People, Minerva Allen states directly, “We keep our history and culture alive by telling of our ancestors and legends to young people.” She tells of learning the Assiniboine way of life from her grandparents, and now she feels a duty to pass along what she knows. Wyoming author Alexandra Fuller talks about and reads from her third memoir, Cocktail Hour Under the Tree of Forgetfulness. Bryce Andrews talks about his decision to move to a cattle ranch in Montana and about the memoir he wrote about his experiences there, Badluck Way. He also reads two passages from the book.